Hide deals from seller "Thrifty Treasures"
No limit per person, limit 1 per transaction. Valid toward anything in the store. Full value of Gift Certificate must be redeemed in 1 visit. 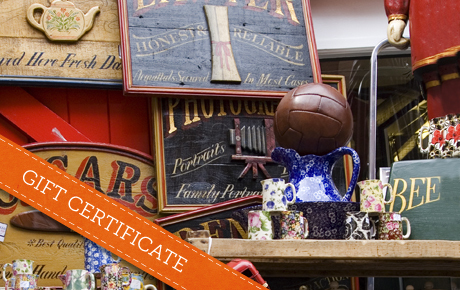 Liven up your living room with 50% off a $20 Gift Certificate to Thrifty Treasures in Bartlett. This unique gift shop offers a variety of antiques, furniture and collectibles to accent your home. After collecting small treasures for more than 20 years, Sam decided to open Thrifty Treasures to offer some of his findings to the public. The large storefront makes for ample browsing, and the variety of objects guarantees that you will find something that suits your fancy. Thrifty Treasures sells unique vases and dishes as well as antique statues and figurines. You can also browse an impressive selection of furniture including sofas, chairs and full dining room sets. Find the perfect new treasure for your home with this thrifty deal. Thrift shop in Bartlett offering antiques, collectibles, furniture and more.